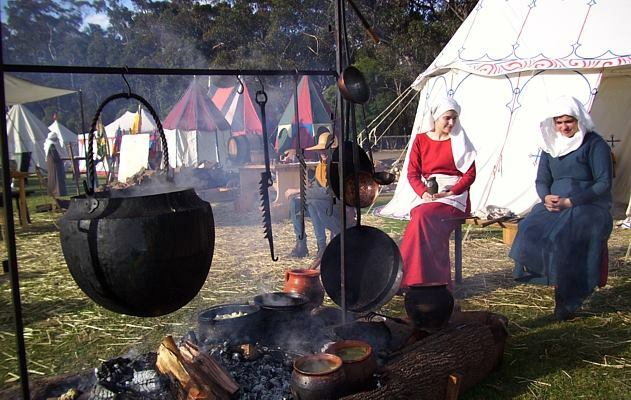 A medieval kitchen runs on three things; fire, water and lots and lots of free labour. We always need the water refilled. At St Ives, we expect to go through at least 50L a day. Please check that the jugs on the tables are filled as are the barrel and jerries. There should be a pot of water being heated at all times. If there isn’t, please ask which pot it is, and then fill and put back on the fire. We will be using charcoal for some parts of the day but the bulk of the heat will be coming from firewood. We’ll need lots of help getting this chopped up into usable bits. If the fire is using charcoal, please don’t throw any scraps on it. Charcoal burns without smoke, which is why we’re using it. Scraps will smoke out the cooks from doing any cooking. You are responsible for washing your own dishes. We will try and get the washing up tub set up early for people to use, but there are a lot of people so please be patient. If you leave your plates, bowls, spoons or other feast gear lying around, kitchen will appropriate it for serving. We may not even mean to. But not all the servers know every bit of kitchen gear and so if it’s left out, we’ll assume it’s kitchens. Please don’t leave modern gear lying around. If it’s left in kitchen, kitchen will move it inside somewhere so that it’s not on the display. And we may be busy when you eventually come looking for it. Choppity choppity chop. There is always more things to be chopped. Always. Food and cooking are very interesting to the public. They did things like we do them. We’d love for people to join in on talking to the public about the cooking display or the food, or about anything in the kitchen. Before each meal, we’ll need help setting things out and then serving the meal. Afterwards, we’ll need help putting away any leftovers, and washing up the kitchen bowls, plates and pots. Everyone cooking is a volunteer. They didn’t have to do this, they chose to help. So please be patient with any timing issues or if things don’t go perfectly according to plan.